This can be a simple pros and cons list. And be honest with yourself! When you're in the mindset of wanting to end your marriage it's easy to come up with all of the great things you expect to have on the other side; however, there are negative ramifications you may not have considered before. You just may have to give up everything about the current life you have. To start your Save Your Marriage in 30 Challenge visit saveyourmarriagein30.com and click "Videos". Good luck! Happy Monday everyone! We know everyone is getting back into the swing of things after the holidays so we have just one piece of breaking news for you today. 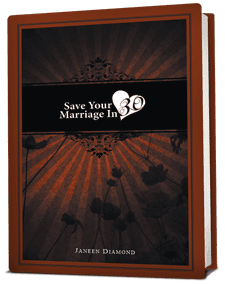 Save Your Marriage in 30 by Janeen Diamond is now available at all Salt Lake City, UT Barnes and Nobles bookstores! If it's not available at a store near you they would be happy to order it for you! And don't forget amazon.com and saveyourmarriagein30.com. With a new year comes new opportunity! Take this opportunity to better your relationship! Welcome back to Challenge Wednesday! Again we're talking about the power of positive thinking! Go to a your quiet spot, pull out the old photo albums and remember all of the great times in your marriage. Remember your wedding day and what you were feeling. Go back even farther to when you were dating and just getting to know each other. Harness those positive feelings so you know exactly what you're fighting to save. When you're going through a rough patch in your relationship it's easy to forget all of the great things that it has given you. Think only about the positive and let that drive your desire to keep it together.